New York is the only state in the country that does not allow no-fault divorce, creating what divorce lawyers call institutionalized perjury by forcing couples in failing marriages to essentially lie to a judge. I wrote not to long ago about a case in New York in which the wife threatened the husband with a samurai sword and was denied a divorce and how ludicrous this was. 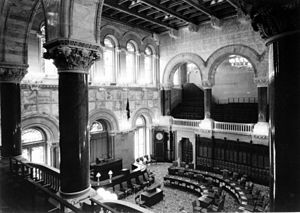 The New York state senate has approved a bill that would permit no-fault divorce, allowing couples to cite irreconcilable differences as grounds for ending a marriage instead of having to assign blame to one party. The state assembly, or lower house, should take up the matter in the coming weeks. Backers of the law are hopeful it will pass and reach the desk of Governor David Paterson, who is expected to support it. California was the first state to pass the no-fault divorce in 1969, and many other states followed soon after. The Catholic Church has fought changes to the law in New York in an effort to keep married couples together and has found an ally in the National Organization for Women (NOW), normally at odds politically with the church on issues such as abortion. It was only a matter of time that this law went into effect, and I wonder how many new divorces will be filed once this law is on the books. It will certainly be interesting to see. Speak to all these mothers of children with autism about the NY Divorce Law. Ask them what it is like to disrupt their children’s routines with visitations. And speak to the mothers who have lost custody because they do what is right for their children, such as Board of Ed recommended speech therapy, etc.